WASHINGTON - Acting Attorney General Matt Whitaker has no intention of recusing himself from overseeing the special counsel probe of Russian interference in the 2016 election, according to people close to him who added they do not believe he would approve any subpoena of President Donald Trump as part of that investigation. Since stepping into his new role on Wednesday, Whitaker has faced questions - principally from Democrats - about whether he should recuse from the Russia investigation, given that he has written opinion pieces in the past about the investigation, and is a friend and political ally of a witness. The two people close to Whitaker also said they strongly believe he would not approve any request from special counsel Robert Mueller to subpoena the president. Mueller and Trump's lawyers have negotiated for months about a possible interview, with no agreement in sight. 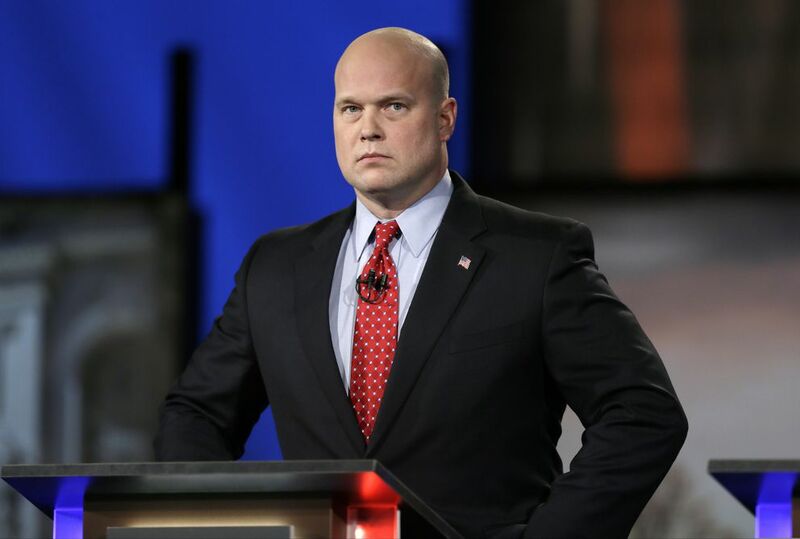 Whitaker's elevation to become the nation's top law enforcement official followed the ouster Wednesday of Jeff Sessions as attorney general. Sessions had endured months of public abuse from Trump, who soured on Sessions because he recused himself from oversight of the Russia investigation shortly after he arrived at the Justice Department. Sessions felt that Mueller's investigation had gone on too long, but also believed it was important that he stay in the attorney general job as a means of protecting the special counsel's work so that, when it was concluded, the public would have confidence it had not been manipulated, according to a person familiar with his thinking. Even after he arrived at the Justice Department, Whitaker harbored frustration about the length of the special counsel probe and doubts about the scope of Mueller's authority, a person familiar with the matter said. He questioned Deputy Attorney General Rod Rosenstein's ability to give Mueller such wide latitude and wanted to explore the bounds of what Mueller was examining, though Rosenstein kept Session's office "walled off" from the matter, this person said. Whitaker did, however, believe that Sessions had no choice but to recuse himself from the matter, the person said. While Whitaker is now Mueller's ultimate supervisor, it was not immediately clear whether that meant Rosenstein would step aside. Justice Department officials said that under normal circumstances, the deputy attorney general would likely play an active, hands-on role in overseeing such a high profile probe, and they had no reason to believe that Rosenstein would now be cut out. Whitaker was virtually unknown to Sessions before becoming his chief of staff. A person familiar with the matter said he got on the White House's radar via conservative circles in Iowa, his TV appearances and his connections with the Federalist Society and other conservative groups. When Sessions's previous chief of staff, Jody Hunt, was departing, Sessions brought Whitaker in for an interview and came to like him, the person said. Another person said that remained true ever after Whitaker took his place.